Virtual assistant Alexa can do many things. In fact, just the other day we told you that Alexa has over 15,000 skills in the U.S. Alexa, which you might call the breakout tech star of 2017, can mostly be found doing her thing on the Amazon Echo smart speakers. But this year, she can also be found on the Huawei Mate 9 and the HTC U11 in certain markets. The smart speaker market is getting crowded as Apple is expected to launch its HomePod this December, and Samsung is also rumored to be tossing its hat into the ring with a Bixby powered unit. Amazon has arranged for Alexa to save you $20 on the purchase of a one-year membership to Amazon Prime. Simply say, "Alexa, sign me up for Prime," and you'll be given the opportunity to pay $79 for one-year of the service. And besides the usual Prime benefits (such as free two-day shipping on eligible items ordered from Amazon, unlimited video streaming of television shows and movies, and much more), you'll be able to take advantage of daily deals that will be offered by Amazon starting today. These deals will run through July 17th. 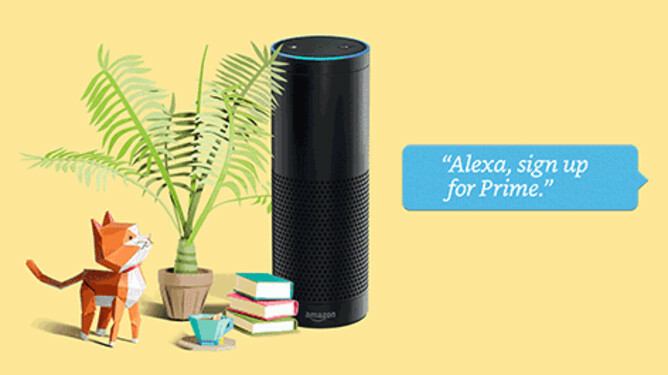 All you need to do is ask, "Alexa, what are the deals today?" First time "voice shoppers" who make a purchase on their Amazon Echo, Echo Dot, Echo Show, Amazon Tap, Fire TV or compatible Amazon Fire tablet from now through July 9th, will receive a $10 Amazon promo code. And if you want to be entered into a $5,000 sweepstakes, simply ask Alexa to reveal to you each day's new deals. That will earn you an entry in the sweepstakes for each day that you inquire about the special offers. And don't forget that next Monday at 9am EDT, Prime Day begins; that means that there will be many, many discounts thrown in your direction. i do need to renew my membership soon but I’m not giving up on my poor ol’ Google Home yet. My patience is being tested by Google lately. Took them long enough to finally add Bluetooth streaming.